Your partner says, "Teeth:3." Can you find the three words related to Teeth that will win the game? You know the agents that your partner can contact safely. Your partner knows the agents you can contacts safely. By giving each other one-word clues that can point to multiple words on the table, you try to find all the agents before your turns run out. 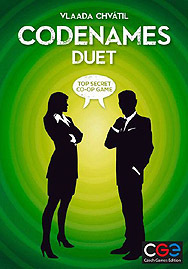 Codenames: Duet is a cooperative game for two or more players. You do not need any other Codenames game to play.